Expect a grand and luxurious vacation when you come to Still Fathoms. This is an exquisite and unique five bedroom home with a tasteful and modern sea life theme throughout the house. The expansive covered porch has a huge underwater mural with a dining and lounging area. You can step off the porch and onto a well manicured lawn with chairs for sunbathing and watching the turquoise waters. When you get up from sunbathing, you can walk right out the gate to beautiful, white sand and gorgeous waters that are well known on the west side of Barbados. The plunge pool is refreshing with a cool dolphin statue on one side. The living room is open with a large sofa for watching television and two other sofas set up for leisure time together. This beautiful property located on Reed’s Bay is just a short drive to Holetown and Speightstown, with plenty of activities for everyone. 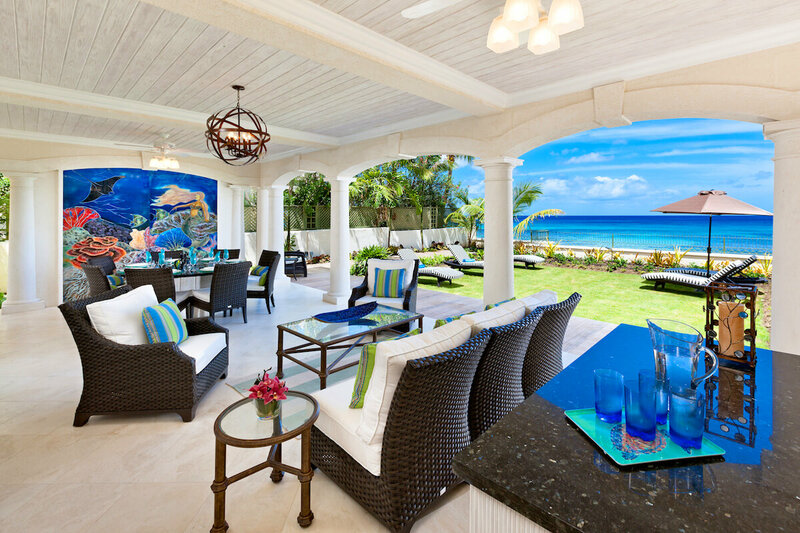 Still Fathoms is a modern and stylish villa located directly on the ocean at Reed’s Bay on the West Coast of Barbados. Guests can sun bathe in the beachfront garden and around the plunge pool, or relax on the shaded terrace with a cool drink, whilst still enjoying the ocean view. The ground level of the villa features a spacious living room / TV area, which opens directly on to the covered terrace, offering plenty of comfortable seating, as well as an alfresco dining area. The modern and well-equipped kitchen is just steps away. All five bedrooms are located on the upper level of the villa, with the master bedroom and bedroom 2 having balconies directly overlooking the garden and ocean. All of the bedrooms are air-conditioned, with ceiling fans and en suite bathrooms. There is also a small TV room on the upper level. The decor of the villa is stylish, featuring cool blues and bright tropical colors with whimsical touches of an “undersea” theme. It’s no more than a 10 minute drive to either Holetown and Speightstown, for shopping, restaurants and other entertainments. Golf and other activities are available nearby, and water sports can be easily arranged. The pool is accessible through some of the downstairs rooms. Within walking distance of the Millie fish market – great for fresh fish. Transfers can be arranged to the villa upon request.